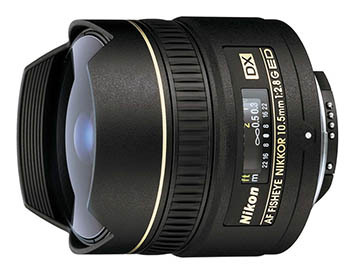 The Nikon 10.5mm f/2.8 AF DX Fisheye produces the distorted visual effect of non-circular fisheyes. It also produces natural colors and sports a built-in lens hood to reduce flare and provide additional protection to the front element. Featuring a close minimum focusing range of just 5.5", this fisheye is great for getting really close to your subject and creating unusual visual effects. It is also good for capturing your environment. • Autofocus is not supported by D40, D60, D3000, D3100, D3200, D5100, and D5000 cameras. • Accepts rear gelatin filters (filters not included). • Minimum Focusing Distance: 5.5"